battenfeld-cincinnati’s LeanEX polyolefin (PO) pipe extrusion line is now available in diameter ranges of 63mm, 160mm, 250mm, 400mm and 630mm, the company announced. “We extended the portfolio due to demand from our customers. They liked the concept of a basic, turnkey line with high line speeds and outputs, which we introduced with the LeanEX 63, but increasingly wanted to produce larger diameter pipes,” said Toni Bernards, CEO at battenfeld-cincinnati China. Shandong Huaxin Plastic Pipe Co. Ltd. was one of the first domestic companies to buy a LeanEX line, ordering a total of 20 LeanEX 63 lines in 2009. “We are very satisfied with LeanEX. The lines have been running continuously for the past years and still work perfectly. Originally, we bought LeanEX lines because we wanted a complete line from one supplier. Also, LeanEX lines are easy to handle, fully automated and reliably produce high quality pipes. Another important point was the quick availability of spare parts and the local service,” said Li Jie, Chairman of Shandong Huaxin. The name LeanEX stands for “lean extrusion”. It can produce pipe at high line speeds of 40m/min for 32mm and 63 mm pipe lines, 15m/min for 160mm and 250 mm pipe lines, 5.5m/min for 400mm pipe and 5m/min for 630 mm pipe lines. The extruders are built at battenfeld-cincinnati’s China facility with selected European components and locally sourced screws, barrels, motors and drives. 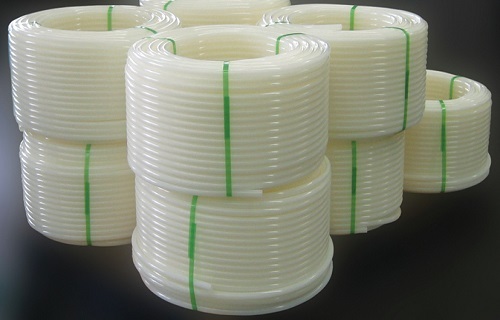 Available in sizes 50mm, 75mm and 90mm, the output ranges from 350-800kg/h for high density polyethylene (HDPE) and 280-600kg/h for polypropylene random copolymer (PP-R). LeanEX’s direct drive results in constant outputs and low-noise operation while the combination of grooved feed bush and barrier screw enables high quality plastification and the nitrided barrel and hard-alloy coated screw ensure longer lifetimes, the company stated. The pipe heads come from the battenfeld-cincinnati helix series and can be adapted to the PO material processed. Its patented VSI design is said to offer high throughput rates and optimal melt distribution for an even melt flow, narrow thickness tolerances and a smooth inner pipe surface. For high lines speeds and smooth pipe surfaces, the LeanEX line comes with calibration sleeves as standard. For PP-R pipes up to 32 mm, disc calibration sleeves are used and VKS calibration sleeves for all other diameters in PP-R, PE and PE of raised temperature (PE-RT) pipe extrusion.